Rebecca Krinke (2005). Contemporary Landscapes of Contemplation. Rebecca Krinke, editor. Oxon, UK: Routledge, Taylor & Francis Group (2005). While Eastern cultures and the Western mystical and monastic heritage offer ample exemplars of the contemplative mind, they are scarce in lay society in the West. The seeker alone in nature is one archetype, exemplified by Thoreau at Walden Pond; if there is a root text for considering the contemplative mind in American society, it might be Thoreau's Walden. And as I developed this book and earlier symposium, a question I have been asked by several people is: "Wouldn't the wilderness be the most effective contemporary landscape of contemplation?" Perhaps as an outgrowth of reading books such as Walden or personal experiences, some see the wilderness as capable of evoking a more potent contemplative response than other settings. And it is true that elements of nature have been seen around the globe and throughout time as having restorative benefits. Until recently this has been essentially an intuitive understanding, but the research of environmental psychologists Rachel and Stephen Kaplan, Roger S. Ulrich, and others has indicated that contact with nature, especially vegetation, has a beneficial effect on physical and psychological health. Ulrich designed several different types of studies that demonstrated that contact with nature produced faster and greater recovery from stress as shown by lower blood pressure, less muscle tension, reduction in anger and an increased feeling of well-being. These are many-of-the same beneficial effects found through a contemplative practice. The question of whether wilderness might be the most effective contemporary landscape of contemplation adds another layer to our discussion, because the question implies that untouched nature is more powerful than a designed landscape as a contemplative realm. It also reveals that a retreat from our predominately urban life is seen as restorative. Research has shown that contact with nature is beneficial, but not what settings are the most beneficial. The Kaplans have studied "wilderness experiences" and their research has found that "nearby nature," which they define as everyday places such as backyards, has virtually as much restorative power as the wilderness. These findings may seem counterintuitive, or perhaps reassuring. The effect of exemplary, designed spaces on human health and development is an area ripe for research. If the idea of the wilderness as a realm of contemplation provides an ongoing myth about our relationship with the earth, what might be some of the other myths that contemporary culture is writing? The Bloedel Reserve's Reflection Garden (page 6) has qualities of beauty and serenity that we may intuitively associate with a contemplative realm, but what about the Landscape Park Duisburg North (page 7), on the site of a former blast furnace near Duisburg, Germany? Is it possible that this park, undergoing remediation for contaminated soil and water, with portions of it still contaminated, could also be a contemplative space? Is the postindustrial landscape exactly what we should be contemplating? What ideas of "beauty" underlie our ideas about a contemplative landscape? Does the presence of technology undermine a contemplative realm? Technology also mediates our experience of the contemporary landscape. Thomas de Zengotita, an editor of Harper's magazine, posits in his essay, "The Numbing of the American Mind," that we in contemporary American culture have little direct experience of nature, or of anything else anymore: most of our experiences are through some form of media. And if we try to have a direct experience, it isn't really possible because we have become media saturated. [A] couple of weeks out in Nature doesn't make it anymore ... you will virtualize everything you encounter.... You won't see wolves, you'll see "wolves." You'll be murmuring to yourself, at some level, "Wow, look, a real wolf, not in a cage, not on TV, I can't believe it…." And you will get restless really fast if that "wolf" doesn't do anything. The kids will start squirming in, like, five minutes; you'll probably need to pretend you're not getting bored for awhile longer. Do we agree with this assessment? Are there landscapes we could create that could wake us up again to the direct experience of nature? Or is a contemplative practice the way to wake up to direct experience? Could innovative technology be a key to creating contemporary landscapes of contemplation? Osmose is an immersive virtual reality program of translucent trees and terrain created by the artist Char Davies. She was inspired by her scuba diving experiences to create a different kind of user interface for Osmose than the typical hand-dependent methods, such as the joystick or data glove. Osmose participants wear a harness around their chests to register effects of their breath and balance. (They also wear goggles for real-time visual effects and her program contains localized, interactive sound.) With this hands-free interface, the participants' focus is space, not objects. She writes that her intention is to explore virtual reality's "capacity for refreshing our 'ways of seeing. More than 5,000 [approximately 25,000, as of November 2007]† people have been immersed in Osmose since 1995, and many participants report effects very similar to experienced meditators, such as a profound sense of body/mind relaxation, and losing track of time. While watching the Osmose participants, it was apparent to observers that most participants move quite rapidly from a state of "doing" to one of "being." After approximately ten minutes, most participants undergo a noticeable change – their gestures and expressions relax and slow – as they are drawn into this new world and their new perceptions. This is in sharp contrast to their initial state of immersion, where their movements are quick, and focused on exploring the virtual landscape as much as possible, similar to how one may explore an actual new setting. Do technologies like Osmose threaten our connection to the physical world or do they offer possibilities for reconnection? If Osmose is an effective contemplative technology, would its more widespread adoption be a positive addition to contemporary life? What might a perceptually refreshing work of landscape architecture look like? 13. For example, see R. S. Ulrich, "Effects of Gardens on Health Outcomes: Theory and Research" in C. C Marcus and M Barnes (eds.) Healing Garden: Therapeutc Benefits and Design Recommendations, New York: Wiley, 1999 and the Special issue on Restorative Environments in Environment and Behavior. 33, 4. July 2001. 14. R. S. Ulrich and R. Parsons, "Influences of Passive Experiences with Plants on Individual Well Being and Health", in D. Relf (ed.) The Role of Horticulture in Human We11-Being and Social Development, Portland, OR: Timber Press, 1992, pp. 99-100. 15. R. Keplan and S. Kaplan, The Experience of Nature: A Psychological Perspective, Cambridge and New York, Cambridge University Press, 1989, p. 195. 16. T de Zengotita. "The Numbing of the American Mind: Culture as Anesthetic." Harper's, April 2002, p. 37. 17. 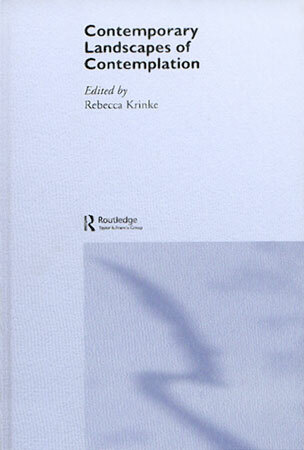 C. Davies, "Changing Space Virtual Reality as an Arena of Embodied Being" in J. Beckmann (ed.) The Virtual Dimension: Architecture, Representation, and Crash Culture. New York: Princeton Architectural Press, 1998, p 145. 20. C. Gigliotti. "Reverie, Osmose and Ephemere: Dr Carol Gigliotti Interviews Chev Davies" in K. Deepwell (ed.) n. paradoxa, International Feminist Art Journal, 9 (Eco)Logical: 64-73, 2002. Online. Available HTTP: http://immersence.com/index.html [available at www.immersence.com/publications/2002/2002-CGigliotti.html].